There are plenty of outdoor pursuits nearby including the Keswick Climbing Wall at Goosewell (1 mile away). There is a cycle track along the old railway from Threlkeld to Keswick (1 mile) plus numerous circular walks from the cottage. Derwentwater Marina is 3 miles away and offers sailing, canoeing, rowing, fishing. Or you can just feed the ducks! Ornithologists will find a variety of wild birds visiting Shundraw. We are RSPB members and try to encourage our feathered friends by planting trees and shrubs that are important to their habitat. 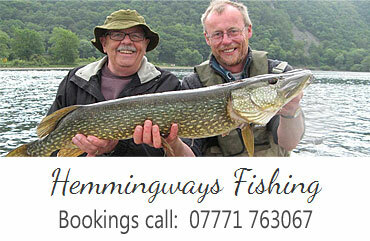 For keen fishermen and women we highly recommend Hemmingways Fishing. Eric Hope can provide all you might need for a days fishing including quality fishing tackle, boat where appropriate, good humoured tuition, full insurance cover and safety equipment, guide service with our legendary shoreline lunch available by arrangement. All you really need are an Environment Agency licence for the day available either on line or from any post office, suitable footwear and a waterproof although the odd snack for the guide is always appreciated! There is pony trekking 6 miles away at Rookin House, golf at Keswick Golf Club 2 miles or you can try your hand at putting or crazy golf in Hope Park, Keswick. Keswick has indoor attractions for those wet days, including a museum on Station Road, Cumberland Pencil Mill museum, swimming pool and the Puzzling Place. There is also the world famous Theatre by the Lake. All well worth a visit. And if ancient monuments are your interest, Castlerigg Stone Circle is only a mile away and a must to visit if only for the panoramic views of the stunning scenery. We are Ambassadors for the Theatre by the Lake and our guests can see a summer show there at a reduction of £3.00 per person. We can recommend a visit. More information can be found in the cottage.